The Bulldogs come away with a 36-17 road victory. JACKSONVILLE, Fla. — Jake Fromm threw three touchdown passes, ending speculation about his losing the starting job to freshman Justin Fields, and No. 7 Georgia beat ninth-ranked Florida 36-17 on Saturday. 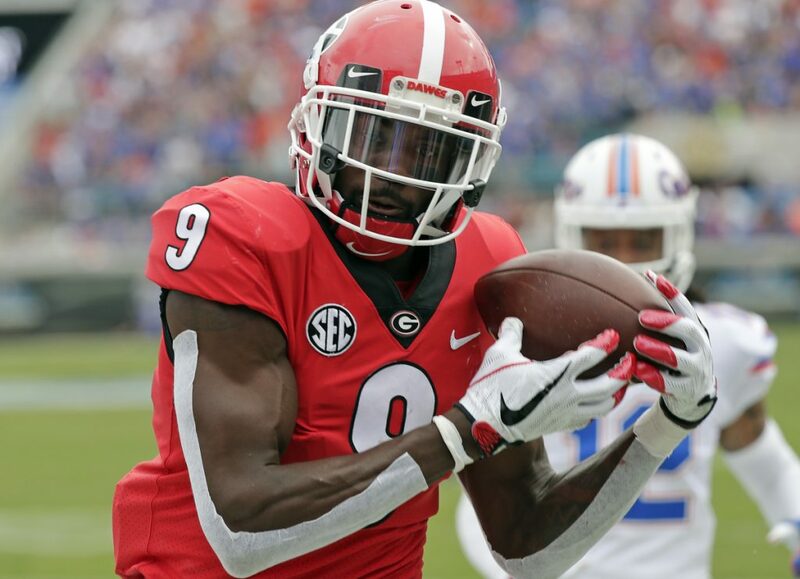 The Bulldogs took advantage of Florida’s three turnovers and an injury to cornerback C.J. Henderson to win the “World’s Largest Outdoor Cocktail Party” for the second straight year. Fromm completed 17 of 24 passes for 240 yards, none bigger than the three for scores – all on third down. (2) CLEMSON 59, FLORIDA STATE 10: Trevor Lawrence threw four TD passes, and Clemson (8-0, 5-0 Atlantic Coast) handed Florida State (4-4, 2-4) its worst home loss in program history. Lawrence completed 20 of 37 passes for 314 yards before leaving late in the third quarter. Tee Higgins and Amari Rodgers each had two touchdown receptions. The Tigers are 8-0 for the seventh time in history. (8) OKLAHOMA 51, KANSAS STATE 14: Kyler Murray passed for 352 yards and three touchdowns and ran for another score to help the Sooners (7-1, 4-1 Big 12) to a home win over Kansas State (3-4, 1-4). Oklahoma rolled up a season-high 702 total yards and only punted once. (14) WASHINGTON STATE 41, (24) STANFORD 38: Gardner Minshew completed his first 19 passes of the second half and drove Washington State to a 42-yard field goal by Blake Mazza with 19 seconds remaining to put the Cougars (7-1, 4-1) in sole possession of first place in the Pac-12 North with a victory at Stanford (5-3, 3-2). CALIFORNIA 12, (15) WASHINGTON 10: Linebacker Evan Weaver scored on a 36-yard interception return in the third quarter after Washington (6-3, 4-2 Pac-12) made a change at quarterback, and California (5-3, 2-3) won at home. (17) PENN STATE 30, (18) IOWA 24: Nick Scott intercepted a pass to thwart Iowa (6-2, 3-2 Big Ten) at the Penn State 2 with 3:18 left and the Nittany Lions (6-2, 3-2) held on to avoid a third straight home loss. NEW HAMPSHIRE 34, VILLANOVA 0: Carlos Washington had 179 yards rushing and two touchdowns and quarterback Trevor Knight ran for two scores to help the Wildcats (2-6, 1-4 Colonial Athletic) beat host Villanova (3-5, 0-5). JAMES MADISON 13, STONY BROOK 10: Tyler Gray kicked a pair of fourth-quarter field goals and James Madison (6-2, 4-1 CAA) rallied past visiting Stony Brook (6-3, 4-2). DARTMOUTH 24, HARVARD 17: Quarterback Jared Gerbino rushed for 183 yards and a score as host Dartmouth (7-0, 4-0 Ivy League) beat Harvard (4-3, 1-3).